Southampton, PA — AdvantaPure will exhibit its single use products and molded components for the pharmaceutical and bioprocess industries at the Interphex trade show in New York City, May 1-3, booth 3055. The show is the premier event for the pharmaceutical industry each year and brings together suppliers and customers for one-on-one communication and product demonstrations. Also on the schedule is the Single Use Applications Conference to be held in San Francisco, Calif., June 4-6, booth 209. This conference and exhibition will focus on the application of single use processing systems as they relate to biopharmaceutical manufacturing. Seasoned AdvantaPure personnel will be on hand at both events to discuss how and why single use products are more popular than ever in the pharmaceutical and biologics manufacturing arenas. AdvantaPure will feature its single use molded assemblies for batch filling and sampling at the shows. The assemblies are ISO Class 7 clean room manufactured and constructed from tubing and molded fitting connections such as wyes, tees, crosses, reducers, and Tri-Clamps™. 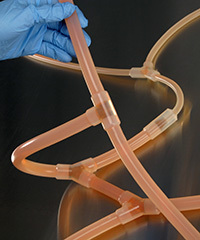 The molded connections eliminate many barbed fittings and provide a smooth inner surface for even, unrestricted fluid flow. They also help reduce the risk of a wasted batch of costly pharmaceutical product due to fitting leakage. Customers can select from platinum-cured silicone or AdvantaFlex® TPE (thermoplastic elastomer), and then add filters, bags, and bottles to reduce end-user assembly time. Vaccine manufacturers, drug producers, and vitamin and supplement makers utilize single use systems to reduce cross contamination, simplify cleaning validations, and reduce costs. Other products to be displayed at Interphex include AdvantaPure's flexible process hoses of silicone, fluoropolymer, and rubber; the new AdvantaTube™ Sealer and Sterile Welder for AdvantaFlex TPE tubing; sanitary stainless steel fittings; hose identification solutions; and BioClosure™ container closures for vessels of glass, plastic, and metal. NewAge Industries' Verigenics™ division will also be represented at the show and will highlight its RFID and tracking products. The company also recently exhibited at the ISPE Carolina-South Atlantic Life Sciences Technology Show in Raleigh, N.C., the PDA Annual Meeting in Phoenix, Ariz., and at BioProcess International Europe in Prague, Czech Republic. For more information on AdvantaPure's trade show appearances, contact the AdvantaPure team at 145 James Way, Southampton, PA 18966; phone 888-755-4370 or 215-526-2151; fax 888-258-4293 or 215-526-2167; e-mail: sales@advantapure.com.